The tarantula spider is less dangerous than the average bee, but it sure is scary! Part 3 of our spider control series. Web control, sealing holes and cracks, and good storage management will save you time and money in the future. And you can do it yourself! But if you are going to hire a professional spider control specialist, make sure he knows what he is talking about and what he is doing. The simple background info and questions described here should narrow his knowledge down to the basics. Start by cleaning, vacuuming and organizing storage areas, attics, basements, containers, undisturbed areas, etc., frequently to discourage them from invading the home. Don't forget the webs. Removing webs is quite easy if you use a broom or mop. For webs outside and under decks, window ledges, porch, patio roofs or roof eaves use water hose spray and/or cobweb eliminators. When storing stuff in boxes and other containers make sure they are sealed. This reduces the risk of finding them in the most unlikely places but also helps prevent from transporting the tarantula spider to another location. Use recommended spider pesticides to spray inside your home. Once you find the one you like, read instructions and start spraying all around windows, doors, facings, baseboards, attics, basements, and all storage places thoroughly. When choosing the right spider control pesticide make sure they contain synergized pyrethrins, resmethrin, tetramethrin, deltamethrin, cyfluthrin, or bifenthrin. Doing chemical control does not always result in total spider control, the reason for this is that all pest constantly move and reproduce around the home. This means that although you might have controlled arizona spiders right where you intended does not mean that they did not reproduced elsewhere in the home. A recommendation given here can't be done without the other. You are the best judge about your own health, but here are some general things you need to know. Pain and swelling after a bite can be reduced by applying ice, alcohol or ammonia right on the bite. If bite is severe call the doctor you trust and if at all possible take the spider along with you to see the physician. 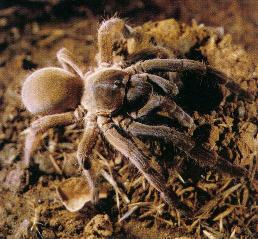 When we think of tarantulas, we think of how big and hairy they are and that is what makes them scary. Tarantulas do bite, however their venom is weaker than the average bee. 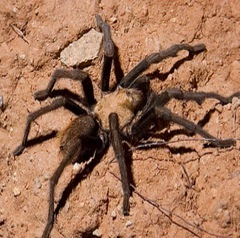 There are many types of tarantulas commonly found in the dry, desert parts of the world; including Arizona. Their bodies can range up to 4 3/4 inches long with their leg span as long as 11 inches. Tarantulas do not generally spin webs to capture their prey; they hunt for their prey; injecting venom and paralyzing the prey. After eating, they may not eat again for up to a month. They have very few enemies, but the pepsis wasp is the exception. The pepsis wasp will paralyze the tarantula and inject paralyzing venom into the tarantula. Pepsis wasps would then lay its eggs on the tarantula, and the larvae would feed on the living tarantula. During any implementation of your own spider pest control you are likely to run into some kind of hurdle which may cause you to just give up and call somebody to take care of the tarantula spider problem at home. Aside the fact that you should ask if the professional in mind is insured, has a good reputation and is trustworthy YOU have to make sure he is knowledgeable. Here are some basic principles you need to and perhaps ask them before hiring anyone. Know that powder formulation, often called "wettable", in most cases can be effectively used on surfaces like concrete, bricks and wood. Know that the brown recluse spider is much better treated if a combination of "cleanliness, residual sprays and dust chemicals is used. Cannot replace treatments described above with aerosol fogs and expect them to be effective. These only work on all already exposed stages of spiders; They are useful as a supplement treatment but not if used without dusts, residual sprays and..... yes.. you guessed it, cleanliness!! !